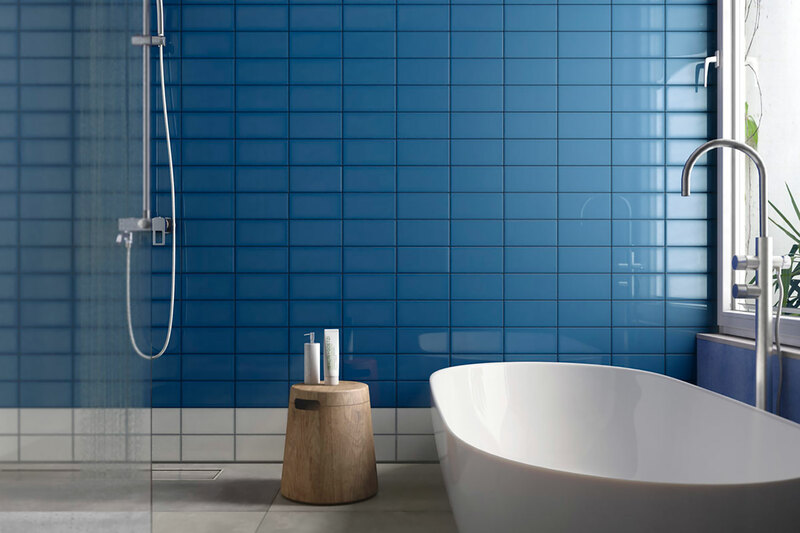 Iris Ceramica porcelain becomes an object of design in cladding for homes and businesses alike, thanks to the creative contaminations of Quayside tiles and brilliant materials from the Lol collection. Porcelain tiles have ushered in a new season of wall coverings. The bathroom and the kitchen, the living room and the bedroom, have been given new expressive power thanks to the potential of beautiful high-tech ceramics. This new creative lymph goes beyond decoration, permitting cross-contamination of different vocabularies and considerable spirit of experimentation. The results obtained with porcelain tiles pursue customisation and creativity, ranging from rooms that become an expression of our tastes to the desire to add a touch of colour and life to spaces for everyday living. The textures and colours of porcelain also underline details and corners, creating new “spots of light” thanks to the shine and highlights of the tiles. Iris Ceramica, a leading maker of Italian porcelain surfaces, offers several collections of high-tech ceramic surface coverings, including Quayside and Lol. The performance of Iris Ceramica materials represents the latest evolution of beautiful high-tech ceramics, making surfaces even easier to clean without requiring any of the special maintenance techniques typical of more delicate products. In the design of the Quayside line, Iris Ceramica drew its inspiration from materials from factories and construction sites, such as cements, resins, rusted iron and glass, transforming them into ceramic surfaces and above all "into abstract decorative elements defining contemporary new aesthetic concepts". The expressive power of post-industrial design reinterprets refined nuances and tooled surfaces with a futurist aesthetic, underlining their material qualities to create simple, innovative spaces. Quayside surfaces are available in 2 different sizes: 10x20 and 20x20. The former is characterised by the presence of various hues of Grey, Graphite, and Brown, with different graphics enriched with details, and by 6 structures "mixed and juxtaposed with precious decorative pieces to create unique compositions". The square format, on the other hand, shows off the colours Yellow and Red, underlining the brilliance of the ceramics and adding a touch of personality to residential and commercial spaces alike. In addition to cladding, the Quayside collection includes flooring (in the 120x60, 60x60 and 60x30 sizers) of contemporary design to create a cosy, lived-in atmosphere with subtle hues against the background colour of the tile, such as the light colours Sand and Grey and the darker, more solid tones of Brown and Black. Colour is the dominant factor in the Lol collection of porcelain surfaces, available in 6 colours: White, Yellow, Blue, Red, Aquamarine and Grey. Lol’s 10x20 size is perfect with a shiny material to create atmospheres in which "the key words are merriment and creativity". This smaller size, with slight graduation on the edges of individual glossy tiles, permits differentiation of compositions. This makes it easy to create highly personalised spaces in bright, lively colours, in a mood that is bold but never excessive. The Lol collection’s expressive power lies not only in the brilliance of the colours but in its versatility: any room in the home and any other setting (hotel, bar, restaurant) is appropriate for this bright, cosmopolitan, attention-grabbing material that gives spaces an elegant identity. The Lol collection is also completed with numerous graphic decorations to add extra attraction to walls with various possible laying schemes and colour combinations.